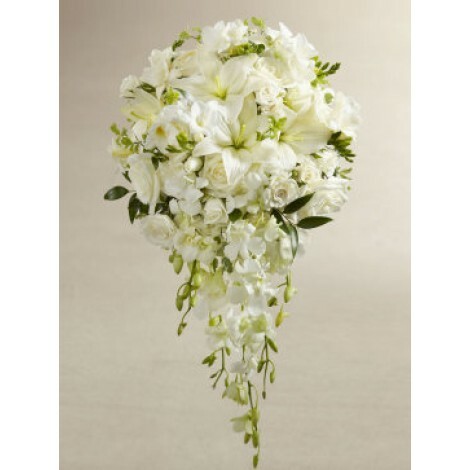 Bring some sweet styled sophistication to your wedding day with this stunning cascade of white roses, orchids, freesia and mini hydrangea. 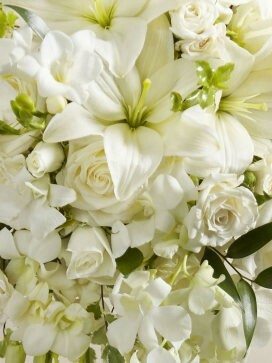 Make a visual impact of sheer elegance and grace with this breathtaking, simplistic yet dramatically detailed array of heavenly blooms. 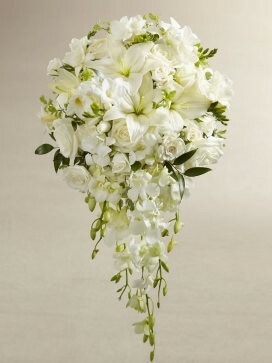 This sumptuous, angelic selection features; dendrobium orchids, roses, asiatic lilies, freesia, spray roses and mini hydrangea, collaborated with an array of beautiful lush greens. This stunning and quite simply striking bridal bouquet is set to premium perfection in a fairytale, cascade style to produce even more of a dramatic impact. Approximate dimensions; 24"H x 12"W.